This week we had our first frost warning in a long time. I’m sad to think about, but summer is drawing to a close. Soon we’ll have to turn on our heat and wear our fall jackets. I’m sad it’s over, but on the bright side, the cooler weather means I’ll be using my slow cooker a lot more often! 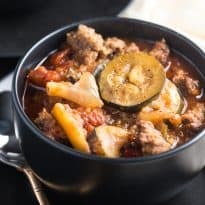 I love throwing ingredients in the slow cooker in the morning and have the delicious aromas permeate the house all day long. Then, when it’s time to eat, I can sit down and enjoy a hearty meal that took almost no effort to make. 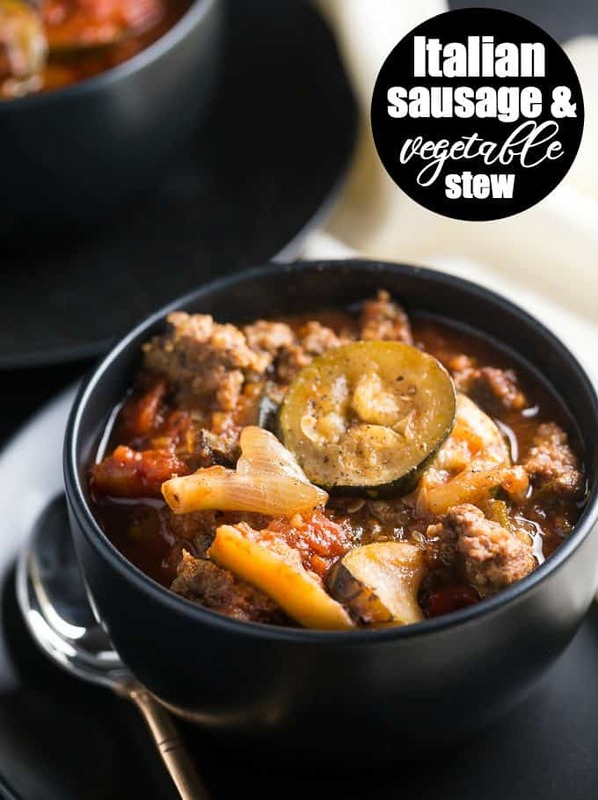 I adapted this recipe for Italian Sausage & Vegetable Stew from one of my cookbooks that I’ve owned for years, All New Slow Cooker by Easy Home Cooking. 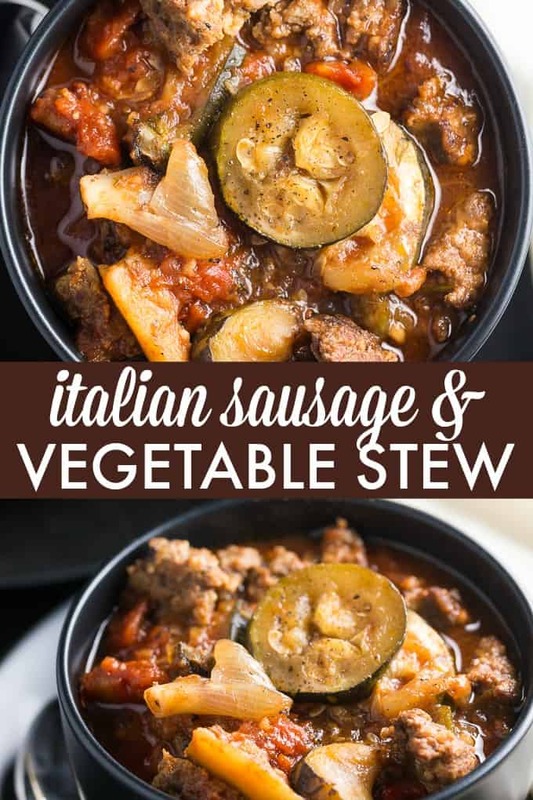 It is full of veggies and the Italian sausage adds in a hint of spiciness. If you prefer your food extra spicy, substitute the mild Italian sausage with hot Italian sausage. For the frozen vegetables, you can use whatever you have on hand. I had a bag of Mediterranean vegetables in my freezer that I used up. The fresh zucchini is really tender and flavourful after roasting in the juices. There’s no extra liquid added. It’s really not needed since the frozen veggies will melt and the juices of the tomatoes and zucchini make it the perfect consistency. 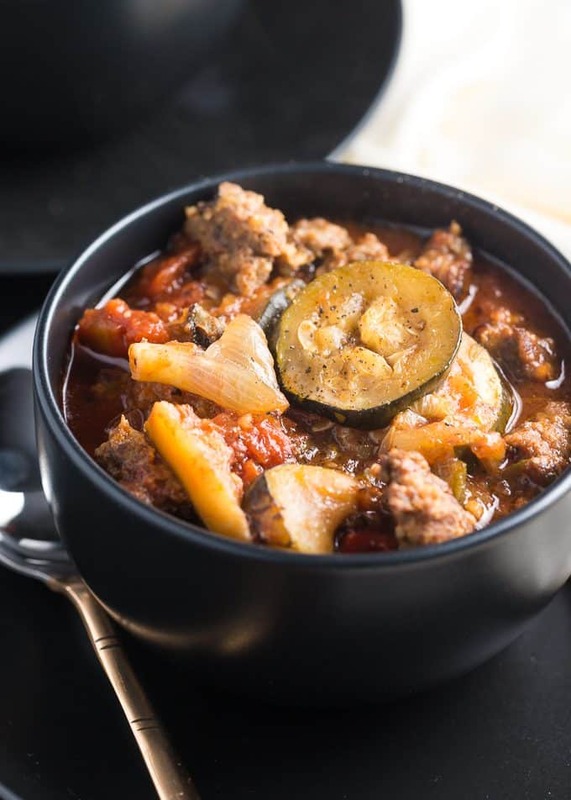 A delicious, hearty stew packed with Italian sausage and Mediterranean veggies. Cook sausage in a skillet on medium-high until browned. Combine sausage, frozen vegetables, tomatoes, tomato paste, zucchini and garlic in the slow cooker. Cover and cook on low for 5 hours or until zucchini is cooked and tender.